A poem and a lovely picture of Arini at her home in Tomohon, Minahasa. Pictures of the time Arini was a "plontji" and other pictures of the PMB. "Es ist so schoen Student zu sein!" Lagu Jerman yang faforit DULU. 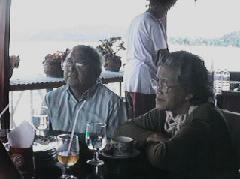 Her home in typical rustic setting in Tomohon always attracted many friends and family members.